At our small company every comment we get has a major impact. Early in the process, when it was just Lynn and Jim doing everything, someone emailed them a list of all the spelling and grammar errors they had made in a DVD and yes, clearly we should NOT be putting out DVDs with *spelling* errors but it's easy to forget that people (us in this case) actually make these DVDs. We make them just like someone knits a sweater or paints a painting. In our case, each of us here has a part of it we do, and unfortunately, a few of us are weak links when it comes to spelling. But because of that one letter, we now *painstakingly* look at every text block at each step of the process to make sure we've got "it's" instead of "its" and (my weak point) "palette" instead of "pallete". This morning about 30 minutes into the day, Jim one of the co-founders, comes bounding upstairs with a huge smile and says, "Kelly, Zach, I'm going to interrupt your important work b/c this is just too cool." 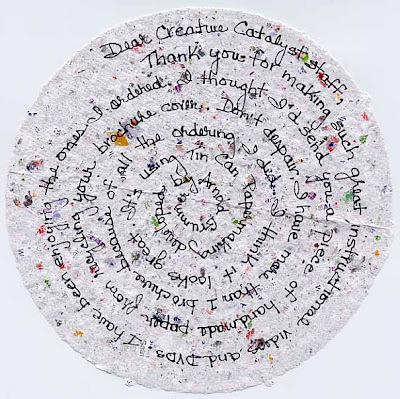 He hands me a 8" diameter circular piece of paper with a note written in a spiral. "Read it out loud," he says. So I do. A customer writes that she loves our DVDs (yay!) 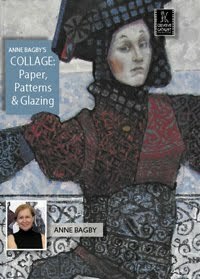 and has actually taken one of our catalogues and used it to make the very paper I'm holding (it's really cool paper). She thanks us for the work we do. I don't think she could know how happy that made everyone in the office. What started out as a rainy dark day just turned into an amazing day. We turn back to our computers with more enthusiasm. Just like when you make something and then wrap it with a pretty bow and hand it over to someone else, you hold your breath to see how they react when it's opened. It makes all the difference when they say, "Thank you, I love it." 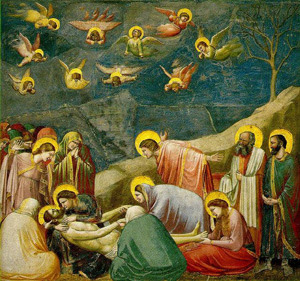 When looking for the roots of the Renaissance, there is no better place to begin than Giotto. Historians know he was born near Florence in 1267 but his journey to becoming a great artist is somewhat murky. Legend has it that he was painting a lamb on a rock one day when Cimabue happened by and saw much potential. Giotto spent his life as both a painter and an architect. He landed a prized commission for the Vatican by free handing a circle and sending it in as his sole entry. He worked in Rome for a decade. 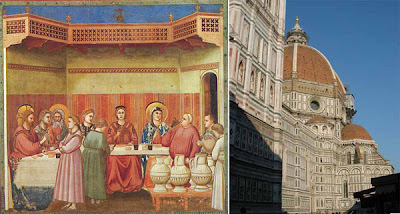 After he returned to Rome in 1320, he worked on frescos and then became chief architect of the Florence Cathedral. Giotto's art developed a unique style and he furthered Naturalism through his seemingly three dimensional forms and strong expressions in both his subjects faces and bodies. I love the idea of fun simple projects that people can use with their children or to add cute touches to holidays. I watched Dayle Doroshow's 2 "International Inspiration" polymer clay DVDs with this in mind and here's what I came up with. All of the projects are really simple and just meant to be fun and cute. Just use a cookie cutter to make a butterfly. Press in a pattern before polymer goes into oven. Paint. Hot glue a flat pin on the back and wallah! Wrap pipe cleaner around your finger to fit. Twist so that it closes and won't pop open. 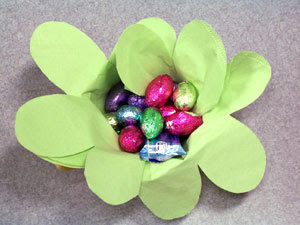 Use the rest of pipe cleaner to make a flat nest to glue the flower to and a leaf. Hot glue a cookie cut polymer flower to the flat nest. Take cookie cut flower and put a hole in the top before baking. 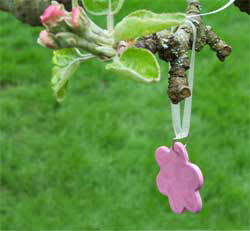 After cools and painted, add a loop and ribbon and hang from a tree inside or out. -Roll out polymer into a sheet (7 on pasta maker). -Cut two "frames" with identical measurements. -Bake as the polymer instructions indicate. -Paint frame with acrylic paint. -After dry sand lightly with sandpaper and remove sections of paint. 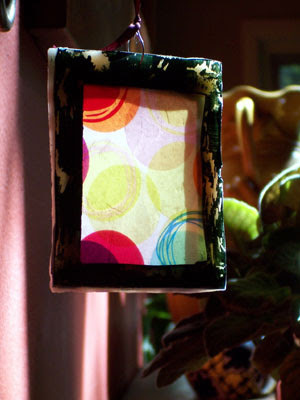 -Cut two pieces a bit larger than the "window" of your frame of plastic and tissue paper. -Spread a watered down gel medium over plastic. Attach right side of tissue paper to glue. -Carefully smooth out eliminating any bubbles. -Repeat with other tissue/plastic. Allow to dry. 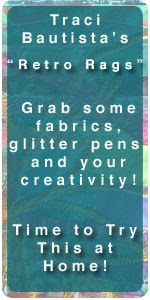 -Spread a thin layer of gel medium on the back of one of the tissue papers. Attach to second. -Plastic side out. -Sandwich everything together so that it goes window, plastic/tissue paper, window. -Make sure the hole as the top meet. -I used a little tape to make sure my "glass wouldn't move around too much inside the frame and then I gel mediumed all the edges. Wipe off gel medium that seeps out the edges or use it to fill the gaps. Put in a hook, hang with ribbon or chain and hang in a window. Here are some of what I'm working on. Instead of Easter Baskets why not give someone a cute Easter cup?! Imagine finding one of these on your office desk or night stand! I used cookie cutters to outline the flowers. -Cut four flowers each a slightly different size. 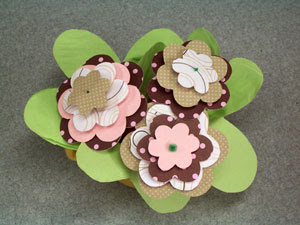 -Slide flowers onto a short green pipe cleaner. -Cut napkin as indicated below and unfold. -Stuff into cute mug and fill with chocolate. -Plant flowers in. 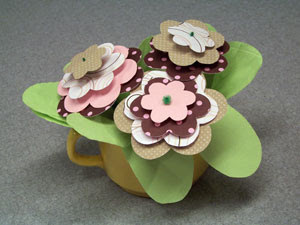 You could even tie a little tag and note with paper and ribbon to the mug handle. Try This at Home- Traci Bautista! Each month Craft Cat has a Try This at Home Challenge. 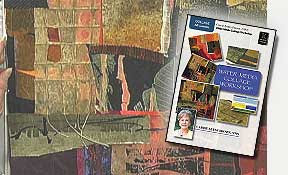 We pick one of our craft arts artists and have a hand at their DVD workshop. We then share some of what we came up with in the next issue. Where does Carrie Burns Brown find the rocks she adheres to her collages. And what does she use to glue them on? Carrie says that she finds her agates all over at gem shops. She found a particularly nice selection at the Denver airport, proving that it's worth looking anywhere and everywhere for good craft supplies. If you're not connecting through Denver anytime soon, gem shops or online vendors might be your best bet. Carrie calls her gems “agates” in her video, but there is a precise term for the type she uses: Brazilian agate slabs. They're readily available on eBay; search for "Brazilian agate slab" or "agate slab." Be sure to check the depth – Carrie uses thin ones. A quick search brought me many gem websites. The first one is a fun learning tool for all the types of agates out there. The second website is a good example of a site ready to sell agates. I can't vouch for any of these sites from a customer standpoint, but they are good places to start your search. 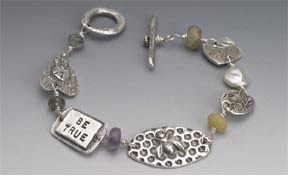 Carrie attaches the gems with E-6000 Jewelry Glue or GOOP, both manufactured by Eclectic Products. A local jewelry or gem shop might be your best bet for purchasing jewelry glue, but you can find GOOP at the hardware store. Large craft stores like Michael's may have both glues. Got questions about Creative Catalyst DVDs? Just ask! Does PMC require a special oven? Precious Metal Clay does require more than a regular oven, but you do have options (even an inexpensive one). 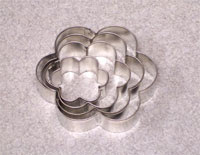 There are several types of metal clay: PMC, PMC+, and PMC3. All three can be kiln fired, but one of the clays, PMC3, can be fired with a butane torch like one used for creme brulee. Sherri demonstrates butane torch firing in her workshop. Just make sure that when you buy your clay, you get PMC3. The other varieties require much higher temperature to burn off the clay binder, and a butane torch just won't work. You could also consider a small propane firing device like the SpeedFire Cone system, which would allow you to work with PMC+ or PMC3.